Gyoza cooking class! Learn how to make Gyoza dumplings from scratch with 3 different fillings such as pork belly, prawn with coriander and tofu with shiitake. Akadashi Soup with homemade dashi stock! 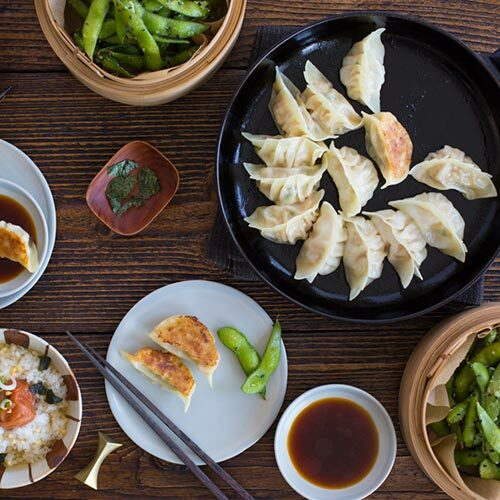 This step-by-step class is aimed at keen cooks who have a passion for making gyoza from scratch! You will learn how to roll and shape your own fresh gyoza wrappers, and stuff with three types of delicious fillings. In addition you will learn how to make homemade dashi stock for an umami rich akadashi soup, and wasabi edamame as a snack! We start by introducing the ingredients, then have a cooking session, and finally we eat what we have made! Please let us know if you have any dietary requirements in advance so we can prepare alternatives.